Domina is akin to the “new kid on the block” in the rogue-like genre of games (marked by dungeon crawling, tile-based graphics, and permadeath.) With a setting in the heyday of gladiator combat, the game brings a few new things to the table both in terms of social live streaming and glorious AI vs. AI gladiator combat. Genre: An action-strategy simulation game. You are the female noble descendant of a fallen Roman house with only 3 slaves to your name and a handful of gold, wine, water, and food. It is practically your job to turn your house’s fortunes around since your useless husband can’t be bothered to lift a finger. The Emperor has decided to hold a grand championship in order to declare a champion of Rome. And it seems like the perfect way for your house to rise to the top. That is really all that the story figures into the game, until the very end of the championship. You only have one year to train, battle, trick, and eventually, win the title: “Champion of Rome”. The game is described as a roguelike, meaning it is meant to be attempted multiple times before you can finally win with minor things to try and alter how you win. 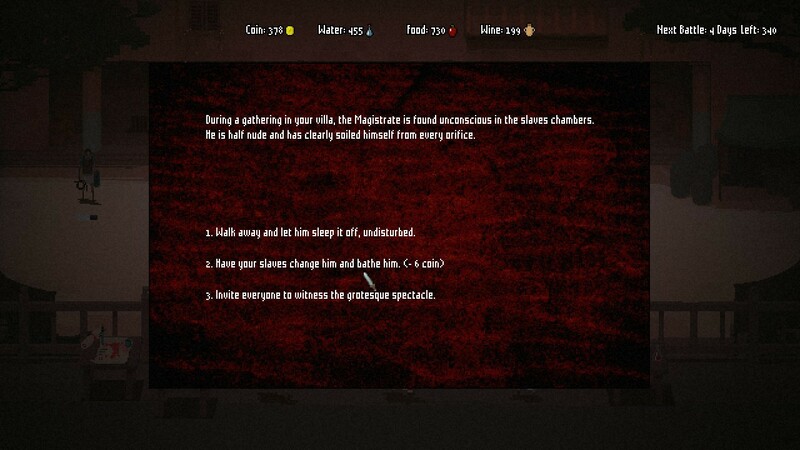 In your house, you may hire a number of NPCs to give you some advantages like more resources, improved equipment for your fighters, or blackmail information on the 2 rulers of the city of Rome, the Magistrate and the Legate. One NPC who you will have no matter what is the Doctore. He effectively works as a coach for your fighters and will teach them new ways to fight. Early on, the Doctore will teach you the ability mind control which is gonna be a big dividing line in the game when you choose how it will all play out. At that point, you pick whether you will be the hero of Rome, fighting tooth and nail, controlling your fighter, or when you will become a team manager and simply pick and choose who gets to fight who, and watch as your dreams end with utter success or failure. That is the basic gameplay for playing the game in Solo Mode, but Domina also incorporates an interesting way to play socially using Twitch. If you incorporate Twitch into your gameplay then your viewers on twitch are able to act as the crowd, watching your gladiators fight to the death. 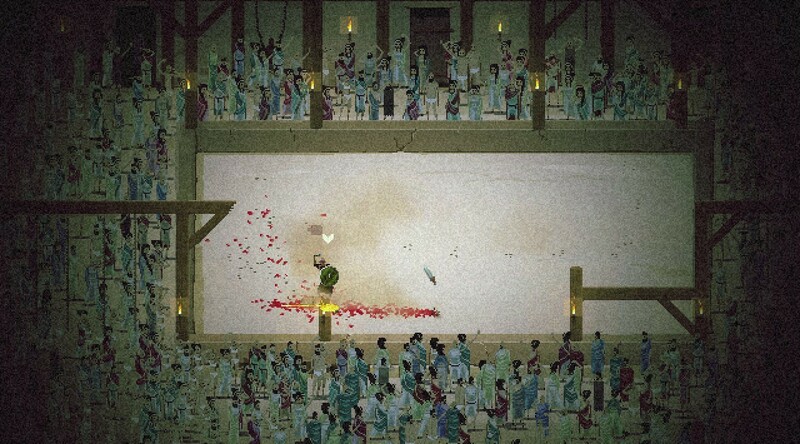 This can earn you a bigger payout when you play as each cheer from the crowd equals another gold coin earned on victory, and boos from the crowd will earn you gold in case you end up losing. Twitch followers also get involved in the game with their mere presence as new gladiators earned in the game will be named after people following your Livestream on Twitch. The followers can also vote on in-game decisions that come up when you run your house. Upon a gladiator’s defeat they are lost and killed in combat, but occasionally they will instead surrender. Upon surrendering it is now a game of chance that they will return to your house alive in one of two ways. If you are playing Normal Mode, then you will be forced to click on your life in a rather taxing mini-game to try and save him kinda like spamming buttons repeatedly. If you are playing on twitch then the choice goes to your crowd, and it is for the internet to choose whether they keep a spot in your yard or possibly in a graveyard. As a word of warning, the internet is always out for blood. The game is interesting without a doubt and there really isn’t a gameplay style like it that I have played before. I felt very immersed being an upper class noble sending men to their possible deaths and eventually owning monsters of the arena that people feared to face. The Twitch integration is what made the game seem innovative for me, and I hope that many games incorporate new and interesting ways to take off like this one did. There is no doubt that once you wrap your mind around this game that you will go on a major power trip. Sadly this does not last. The game is short, able to be beaten in a matter of few hours, which for a roguelike with a lot of replayability is just fine, but that is also where the game falls short. 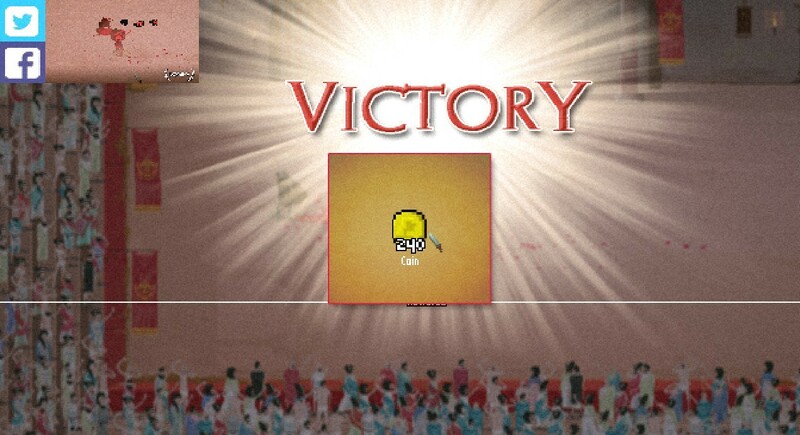 In endless mode, I had hoped to constantly be challenged by newer stronger enemies, but alas I was disappointed. Though it’s surprising that some people are deliberately farming Jupiter’s blessing to get an overpowered gladiator. There are some well-thought-out guides on winning strategies you can check out here. I ended up owning an entire yard full of unstoppable men who easily one-shot any foe they faced. Even my weakest Gladiator could face 5 well-trained men at the same time and barely get a scratch. This quickly became boring. 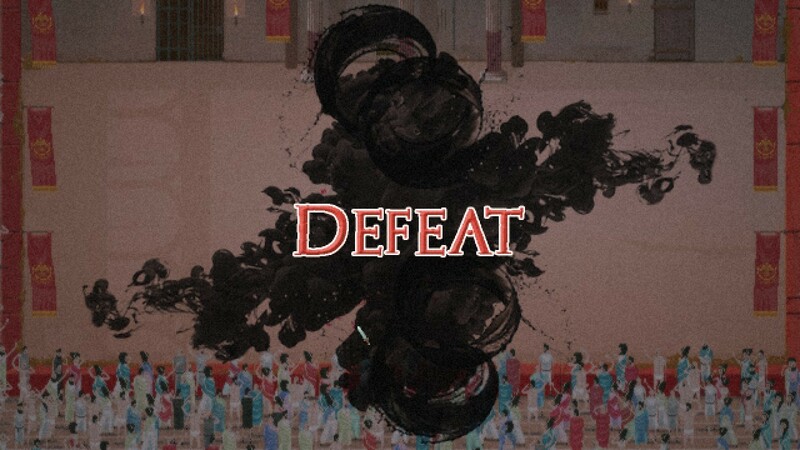 Maybe the incorporation of twitch could lend this game to identify better with your followers, but if you plan to play this by yourself, know that after you’ve finally found your pace in the game, it will lose it’s Majesty shortly thereafter. Domina serves as 2 games in one and learning how to play was rather enjoyable. The music has epic and thrilling gladiator tracks mixed in with a bit of retro. It has solid sprites but the details are hard to notice, all things considered. 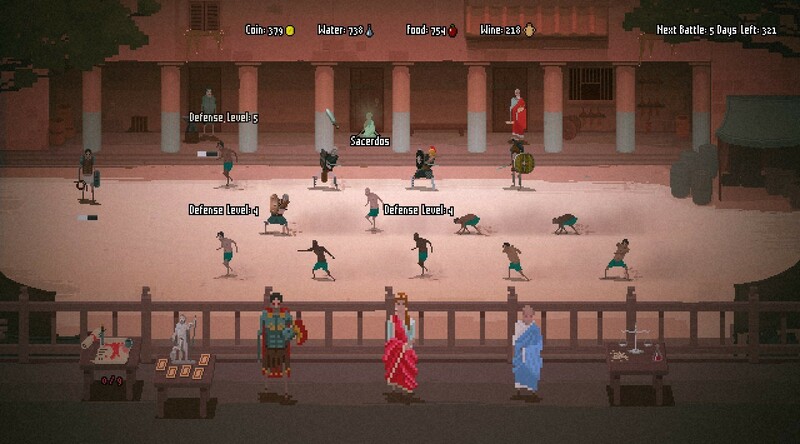 Lastly, the gladiator matches are a source of entertainment despite the lack of a multiplayer mode.